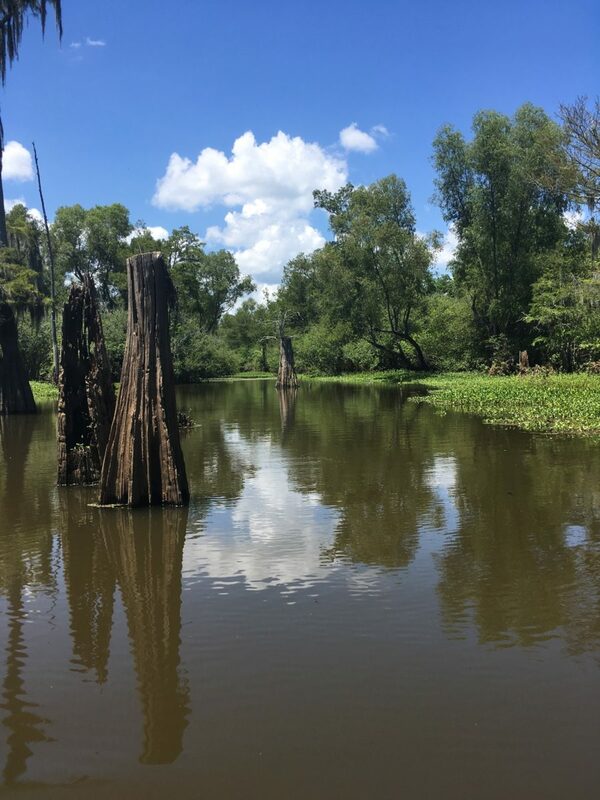 So, you know those super intense ads in tourist magazines that run something like: “AUTHENTIC LOUISIANA SWAMP TOUR! FAST! EXCITING!” and “THRILLS AND CHILLS!”? The ones with photos of the back of somebody’s baseball-capped head, who’s holding a small alligator, or petting an alligator, or feeding an alligator, or otherwise encountering an alligator for the first EXCITING, THRILLING, and CHILLING time? Well, as sure as I am that those tours are all of those things, they don’t hold a light to my friends at Last Wilderness Tours over in Bayou Sorrel. I’ve been on two tours with Last Wilderness now—first, last summer, with my mom, and then a couple weeks ago, with my sister, Merrill—and I can say for sure that if you prefer the more educational, off-the-beaten-path choice, where you may not face immediate risk of death-by-alligator, but rather a slower, more intimate, friendly brush with an alligator toddler who looks like it wants to play more than murder, Last Wilderness is perfect for you. On both tours, my respective family member and I were guided by Al, friendly human swamp encyclopedia. In addition to his encyclopedic duties—“That’s a yellow-billed, white-breasted, soft-throated Gulf warbler,” he said during my last tour, as he pointed to some airborne object in the distance—Al also shares the history of the swamp and the wetlands as we traipse through the lush scene on his 11-seat motorboat. 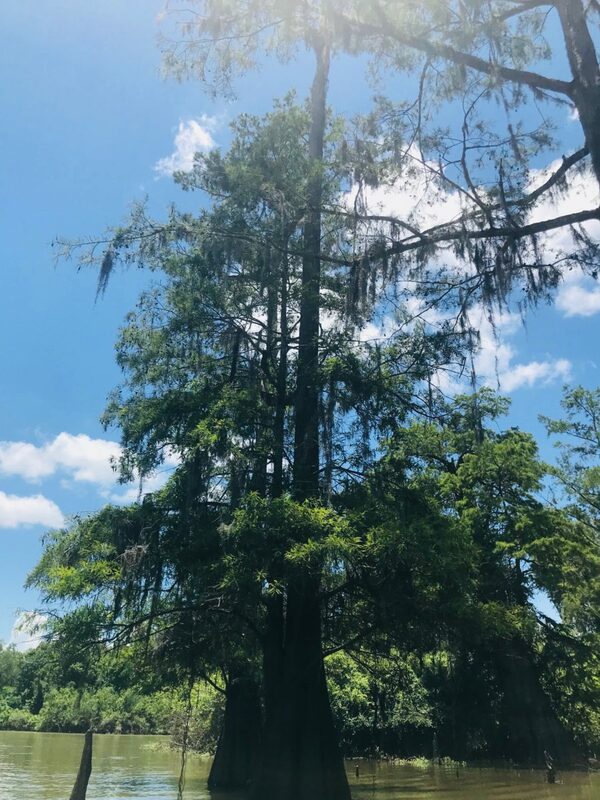 It looks like something out of a fairy tale—big, old trees dripping with Spanish moss, the air sparkling with humidity, and flowers blooming on little fields of swamp greenery, growing right there on top of the water. Al’s dad is Dean Wilson, the founder and owner of Last Wilderness Tours. 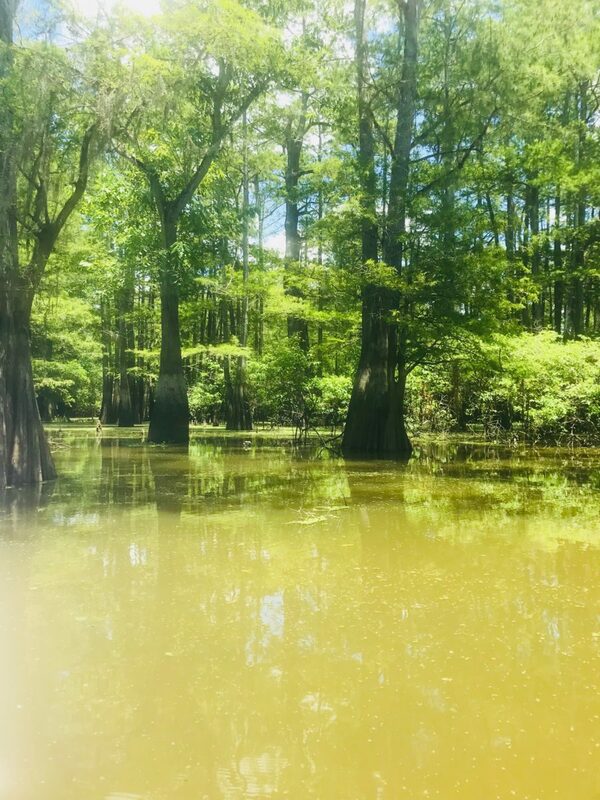 After working as a commercial fisherman and hunter in the Atchafalaya Basin for over 16 years and bearing witness to the destruction of the wetlands from commercial logging and environmental decline, Dean became the Atchafalaya Basinkeeper in 2004. 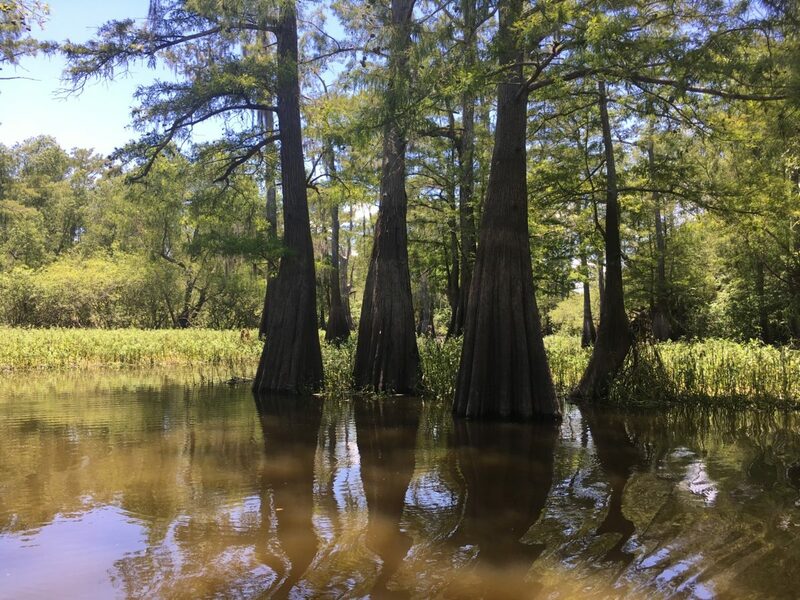 He started Last Wilderness in 2000 to help educate the public about the Atchafalaya Basin, and his passion for preservation and knowledge runs in the family—Al runs all the tours and Dean’s daughter, Silvia, handles the marketing. I don’t remember all of last year’s tour with my mom—not because it wasn’t absolutely fascinating (it absolutely was), but because my memory is terrible—but I do remember that during that one Dean spoke a lot about cypress logging and how destructive the industry has been to the swamp’s very singular ecosystem. The environment isn’t just home to gators (see above) and fish (straight-up FIERCE frolickers with their high jumps and airborne pirouettes—one almost frolicked right up into my face) and birds (Gulf warbler and friends) and bugs (dragonflies that land on you! ), but also boar and deer and other mammals that live peacefully on the ground when the water gets low in the late summer and move into the trees and higher ground when it comes up again. Not to mention the gazillion different plants and trees! 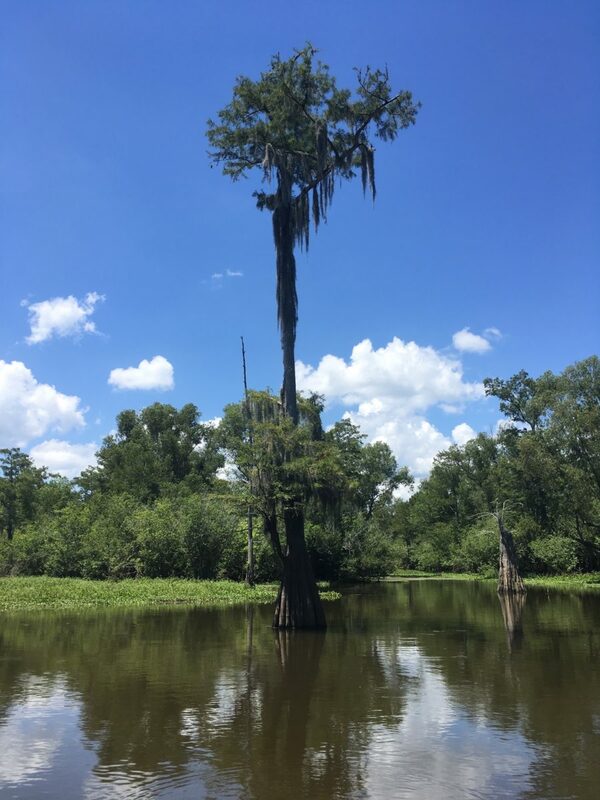 In fact, the cypress-tupelo swamps like the one Last Wilderness tours are the most biodiverse wetlands in North America. See here for more important information about how industry, pollution, neglect, and lack of enforcement has effected the wetlands. Al didn’t talk about logging as much on the tour with my sister a couple weeks ago, but he did talk a lot about cypress trees. Specifically, how amazing they are. Ever heard of cypress knees? Nor had I, before Al informed me and my fellow seaworthy mates of these gorgeous structures peaking up from the water. Turns out they’re part of the cypress root system—their roots go up and down, like the waters in the basin. See? If only we all got taller and thinner with every hundred years, am I right? Kidding. As you can see in the video above, the gator was totally unassuming and mostly cast us major side-eye as it waded in the water, like a bored, hungry queen. Al said it was probably so friendly because it’s been fed by people before, likely by people on swamp tours, like us. Needless to say, we didn’t serve it anything but a ton of attention (and a little shade, via me, but nothing to match that dinosaur’s saucy glare), because, you know, disturbing the environment with human interference is exactly the opposite of Last Wilderness’ mission. Oh and…crawfish! Al showed us some of the traps set up all over the swamp, which fishermen set up and empty every day. Sometimes they’ll have over a hundred traps set up. 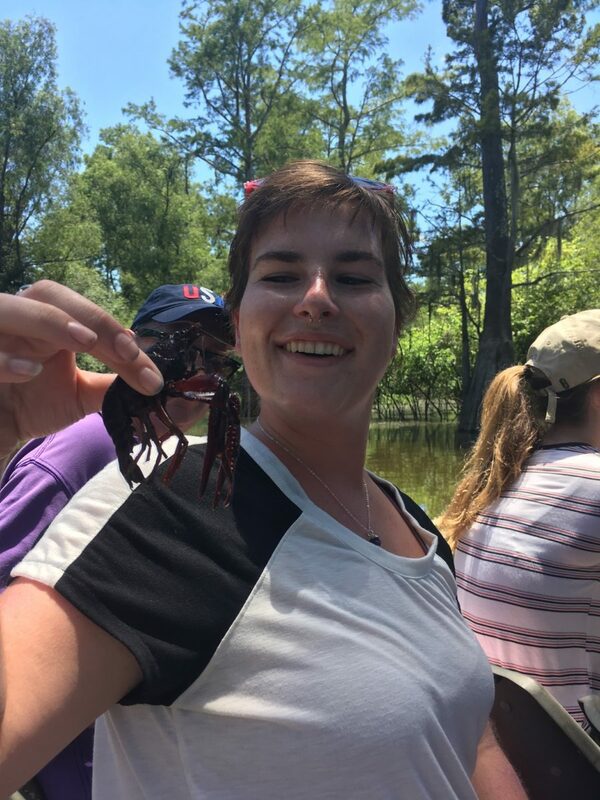 My sister enthusiastically volunteered to hold one of the swamp bugs, seeing as she’s a Maryland-native and has beaucoup crustacean cognizance, what with the crabs and all. Witness her delight! 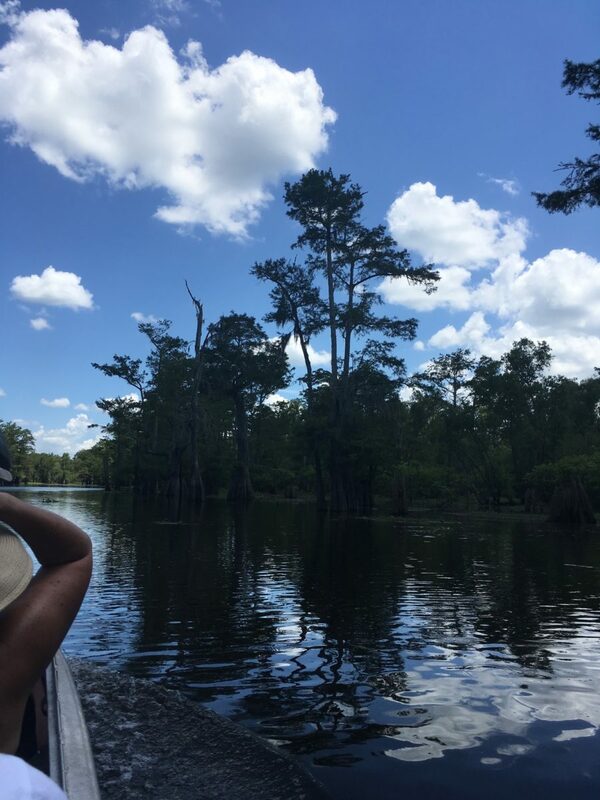 Last Wilderness is a little bit further away from the city than other swamp tours (about an hour-and-a-half drive), but it’s absolutely worth the trip to support a local family that cares so deeply about the environment they grew up in. 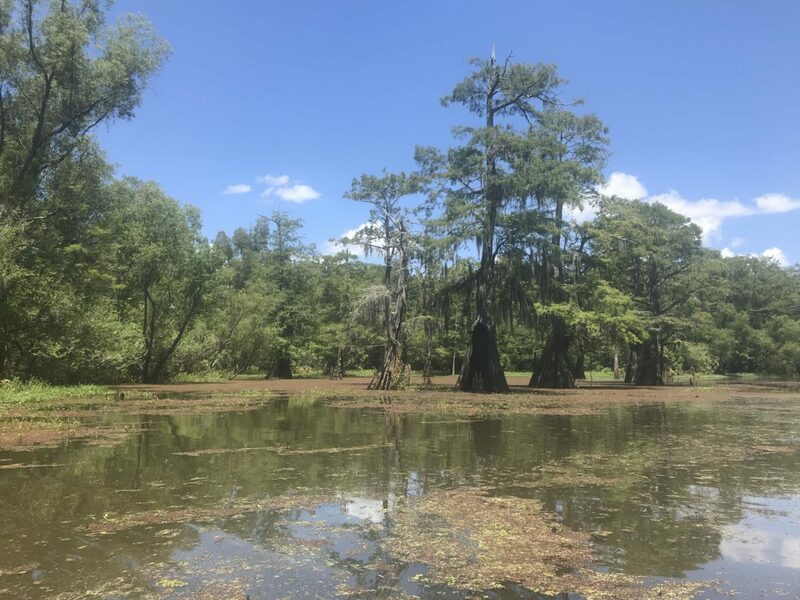 And you can be sure your swampy discovery isn’t to the detriment of the fantastic flora and fauna you get to see there—and you must see it, before it’s too late. Find out more about Last Wilderness tours here.